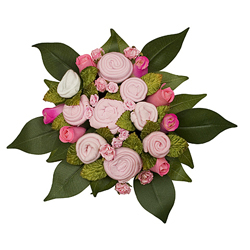 Flowers rolled up of all-cotton layette clothing (size 0-6 months) and fashioned into a charming bouquet. Items include onesies, t-shirt, hat, bib, socks. Available in pink, blue or yellow. Gift boxed. 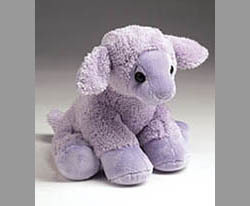 This very special "Lamby" contains a removable insert of dried lavender flowers. Insert can be microwaved, reinserted and then enclosed with Velcro seal. This releases the scent known to reduce fussiness in little ones and help with sleep as well as emitting gentle warmth from the animal body. 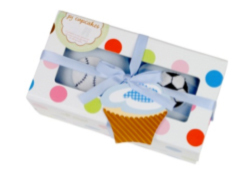 Two onesies (size 0-6 months) are formed into cupcake papers, decorated on top and packaged in this adorable box. All cotton in either blue or pink. 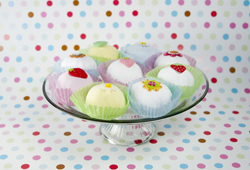 One PJ top and one PJ bottom (size 18 months) are formed into cupcake papers, decorated on top and packaged in this adorable box. All cotton in either blue or pink. Winner of the Grammy Award, these CDs will lull the baby to sleep. 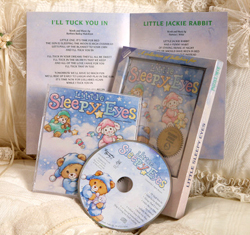 "A Child’s Gift of Lullabys" and "Sleep Eyes" are perfect in any new baby gift basket.